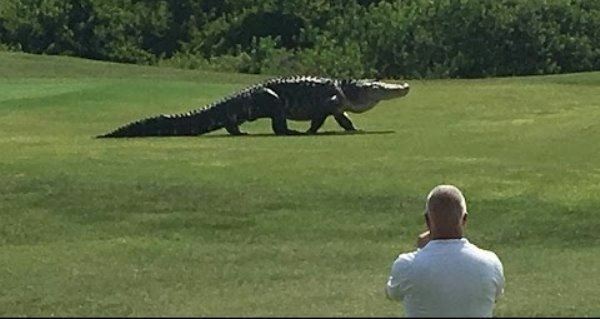 A giant alligator recently dropped by a Palmetto, Florida golf course, stunning onlookers as he strolled through the grounds. The alligator, which Helms speculates is around 15 feet long and which Snopes says is the real deal, seemed to pay no attention to the onlookers. Empirical evidence would tend to back up Schofield’s claim: In 2015, alligators were responsible for only three deaths nationwide. Alligators like the one in the video uploaded Monday are a fairly common occurrence at Florida golf courses. Last year, an alligator nicknamed Goliath was spotted eating a turtle whole on the Myakka Pines Golf Course in Englewood, Florida. Why do these gators gravitate towards golf courses? Next, read about the Nile crocodiles invading Florida’s swamps. Then, check out Florida’s stunning coral castle.